I'm sure you're all thinking it right? March is here, therefore we have to start thinking about what we're wearing on March 17th. Personally I love the color green and therefore I look forward to wearing it especially on this holiday. Is it a holiday though, or more of an excuse to drink some green beer?? Either way, its so fun to see everyone out and about in their Lucky Green wear! The one rule of St. Patrick’s Day is that you have to wear green, but it can be hard to pull off a fashionable St. Patrick’s Day outfit without feeling like you’re wearing a leprechaun costume. Luckily, there are a lot of ways to put together a cute St. Patrick’s Day outfit without going over the top or spending too much. 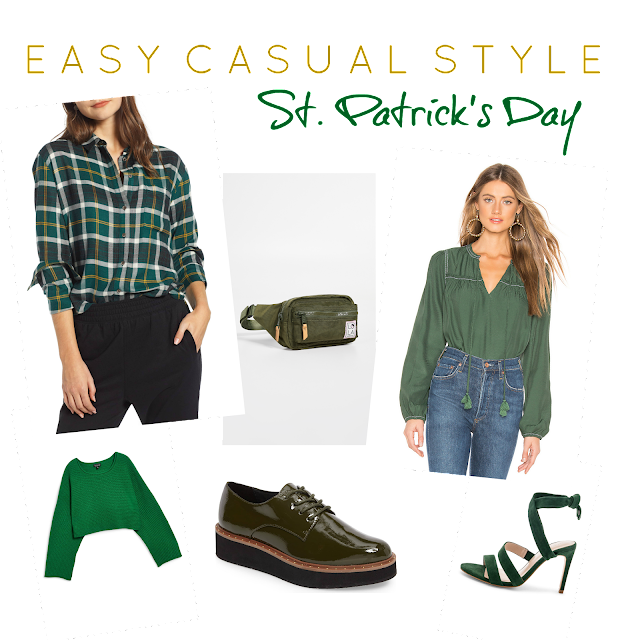 Whether you want to make a statement or you just want to avoid getting pinched, I'm sharing trendy St. Patrick’s Day staple pieces and tips that will have others feeling absolutely green with envy. Just because the theme of the holiday is wearing green doesn’t mean you have to completely cover yourself in it. Not only is it overboard to wear all green, but it’s also incredibly hard, if not impossible, to successfully pull off. Overall, it works better to not try too hard and avoid covering yourself head to toe in green. Remember: less is more. If you aren’t supposed to wear all green, you need to know what colors look good with green to complement your look. What does green match with? Although it may not seem obvious at first, there are actually many colors and shades that will pair well with green. You undoubtedly have at least one of these colors in your closet. Now is the time to play around and see if you can find something that works. Who knows? It may even end up being an outfit you wear more than once a year. Just like every other day, accessorizing is key on St. Patrick’s Day. A good accessory can complete any outfit and get you the look that you’re going for. Shamrocks can be used (tastefully) as earrings, pins, cufflinks or pendants. Green accessories, such as a headband, purse or scarf, can be used to add a little bit of Irish to a regular outfit. And don’t forget gold accents like bracelets or watches!